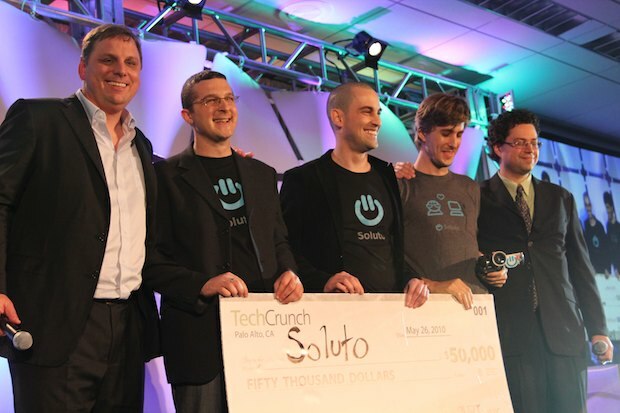 And The Winner Of TechCrunch Disrupt Is… Soluto! It’s that time. After seeing 20 startups plus two audience choices present at TechCrunch Disrupt, last night, that list was whittled down to five finalists: Betterment, MOVIECLIPS, Publish2, Soluto And UJAM. And now it’s time to announce a winner. Without further ado, the runner-up is UJAM. And the winner is… Soluto. The Israeli-based startup offers something that millions of people want — no, need: a way to make their computers run better. One thing that’s interesting about this company versus most of the others in the competition is that they’ve created native software. It monitors your PC to find the things that are likely most annoying to users. For example, it tracks down printing problems, crashy apps, resource hogs — all the good stuff. That alone is interesting. But more interesting is that it offers up solutions for how you can fix your computer issues. And the data they’re (anonymously) collecting about PC problems should be useful across a range of industries and services. Quite simply: if Soluto can convince the millions of frustrated PC users to use their software, they could transform the industry. Or, disrupt it. The company has previously raised $8 million over two rounds, but has been in beta until now. Congratulations Soluto! And congratulations to all the finalists. Each will undoubtedly prove to be disruptive in their own way. Soluto will be the first company to get the TechCrunch Disrupt Cup. In the Fall, they will hand it off to the next winner. We look forward to seeing you all in San Francisco in September.